Now is the time of year for growth and rebirth. Armed with packets of seeds, my children and I have begun planting. We will grow green beans, pumpkins, zucchini, carrots, and sunflowers in peat moss cups in our sunroom. Later we will plant them outdoors and buy tomato plants, basil, and oregano to fill out our mix. The mint will come up again and the strawberry plants as well. The children label wooden Popsicle sticks in crayon with a name and a picture for each kind of plant. — Published in Newton TAB on June 14, 2006. The sun is rising. It is a weekday morning. Across our country, thousands of working women are engaged in a timeless ritual. 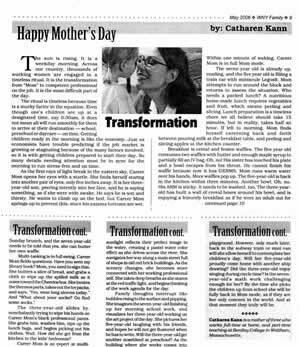 It is the transformation from “Mom” to competent professional on the job. It is the most difficult part of the day. — Published in Western New York Family Magazine in May 2006. 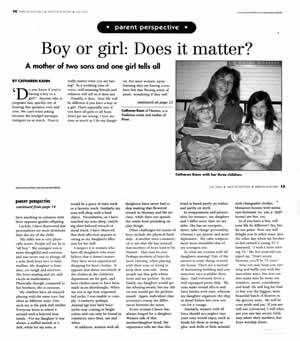 Boy or girl: Does it matter? “Do you know if you’re having a boy or a girl?” Anyone who is pregnant may quickly tire of hearing this question over and over. We can’t resist asking because the boy/girl mystique intrigues us so much. Does it really matter what you are having? In a soothing tone of voice, well-meaning friends and relatives will tell us it does not. — Published in Parents and Kids Magazine in July 2005. It’s that time of year again. 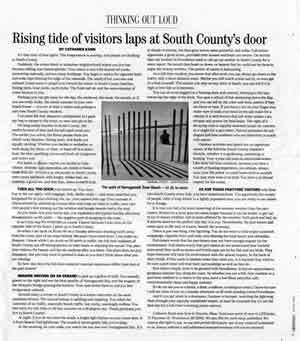 The temperature is soaring, and people are flocking to South County. 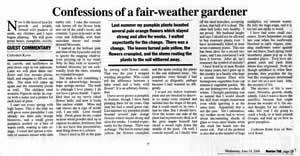 — Published in Lifestyles Magazine, Providence Sunday Journal on July 18, 2004.